Aaron Ramsey has issued a statement after Juventus confirmed his move to Turin this summer, ending an 11-year spell with Arsenal. As per their club site, the Turin giants have announced that the Welshman has signed a four-year contract with them, and will join on July 1, after his current contract with the Gunners expires. 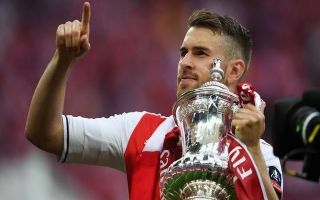 In turn, Ramsey has now shared a message on his social media pages, and has clearly made a point of thanking the Arsenal fans first and foremost for the support that they’ve shown him since he arrived in north London from Cardiff City. It will undoubtedly be an emotional time for him to move on as his stint at Arsenal has been a huge part of his career, but as noted in his tweet below, he is looking forward to starting a new challenge with Juventus, albeit he has promised to continue to give everything for Arsenal until the end of the season. Meanwhile, Arsenal have also issued a statement on Ramsey’s exit, and similarly, it’s another classy message as they have thanked the 28-year-old for the impact he has made during his time with the club. “Everyone at Arsenal Football Club wishes Aaron Ramsey a happy and successful future. “Aaron’s made a fantastic contribution to our club since joining from Cardiff City in 2008. He has always been a consummate professional and will always have a special place in the hearts and memories of Arsenal fans around the world. Time will tell how they fill the void he leaves behind, while for Juventus, it’s another important addition to Massimiliano Allegri’s squad as they look to continue to dominate domestically while also translating that success onto the European stage.